The number of new structures in the West Bank settlements and outposts increased by 69 percent in 2008, compared to 2007, according to a new study released by Peace Now. The report added that the settler population grew from 270,000 in 2007 to 285,000 in 2008. The data collected by the group was published on the same day that the new US Middle East envoy George Mitchell was due to arrive in Israel and two weeks before the Knesset elections. The study charged that despite international agreements, the Kadima and Labor parties had allowed settlement growth to increase. While the government's policy has been to allow settlement growth in areas of the West Bank that Israel is likely to retain under any final status agreement with the Palestinians, Peace Now has charged that 39 percent of the growth in 2008 was outside those areas. If this growth continues, it will no longer be possible to create a viable Palestinian state in the West Bank, Peace Now charged. According to Peace Now, construction was begun on 1,518 settler structures, of which 261 were located in unauthorized outposts. Out of these, 927 structures, or 61%, were within Israel's West Bank security barrier and 39% - 591 structures - were outside it. The 1,257 new structures in the settlements in 2008 represent a 57.12% increase over the 800 new structures erected in settlements in 2007, according to the Peace Now report. Out of 1,257 structures, 748 were permanent and 509 were caravans. In 2007, according to Peace Now, 442 new structures were permanent and 368 were caravans. The report, however, did not distinguish between structures that were built with permits issued by the current government and those that were done under older, preexisting permits. In the 100 outposts the government has committed to evacuate, the report said, growth has more than doubled. In 2008, 227 new caravans were added and work was begun on 34 permanent structures. At the Migron outpost, which is slated to be moved to the Adam settlement in the next few years, five new structures were added and work was begun on a sixth. The report compared these figures to 2007 data, which showed that 82 caravans had been added to unauthorized outposts and work was begun on 16 permanent structures. The report noted that when it referenced a "structure," it did not differentiate between a single-family home and an apartment building. In contrast, the Central Bureau of Statistics and the Housing and Construction Ministry count housing units, rather than homes or apartment buildings. According to the Central Bureau of Statistics, housing starts in the settlements indeed increased in 2008. In the first three quarters of the year, there had been 1,647 housing starts, representing individual apartment units, compared with 1,127 in the first three quarters of 2007. But the number of completed apartment units in the settlements decreased slightly in the first three quarters of 2008. Some 1,146 apartment units were finished in this period, compared to the 1,249 apartment units that were completed in the settlements in the first three quarters of 2007. Shifting to the measure scale of apartment units, the Peace Now report noted that tenders had been issued for 1,184 new apartment units in east Jerusalem in 2008, compared with 793 in 2007. It added that construction plans for 5,431 housing units in east Jerusalem were open for public review, of which 2,730 received final approval, compared to the 391 which were approved in 2007. In addition, it said that 539 tenders were issued for new apartment units in the settlements, compared with 65 such units in 2007, a number that amounted to an eight-fold increase. The report also stated that construction permits had been issued for a 950 unit project in Ma'aleh Adumim, 800 units in Givat Ze'ev and 100 in Ariel. Peace Now further charged that settlers took advantage of the public attention paid to the war in Gaza to expand their holdings in the West Bank, but did not give specific numbers in terms of construction. There were, however, a number of roads that opened during Operation Cast Lead, including one between the settlements of Eli and Shilo; a road from the cemetery in Eli to the Hayovel outpost; and roads near the outposts of Haro'e, Adi and Zayit Ra'anan. 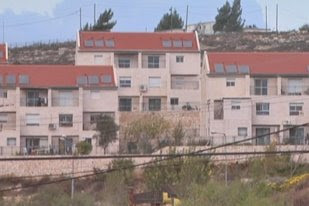 The report charged that the government had confiscated 275 dunams of land from the village of El-Khadr, near Efrat. It also noted that planning work continued in the settlements of Maskiot and Sansana. While both these settlements were laid out and authorized many years ago, they were only recently populated. In effect, Peace Now charged, this constituted the creation of two new settlements. Dani Dayan, who heads the Council of Jewish Communities of Judea, Samaria and the Gaza Strip, said in response that he was glad the group was documenting settlement growth. "We are grateful to Peace Now for investing the funds they receive from European [governments] in documenting the most important Zionist endeavor of our generation, the settlement of Judea and Samaria." But he took issue with the group's charge that settlers had made use of the Gaza war to expand. He said that in contrast to the Left, which organized rallies against the war, the sons and husbands of Judea and Samaria families had risked their lives in Gaza in defense of the country. Michael Sfard, Yesh Din's legal counsel, said the information was a "severe indictment" of Israel's military and government. Israeli authorities are "systematically violating international law and the property rights of Palestinian residents," he said in a statement.